Where else can you get so much for such a small investment in time? Family meetings provide a wonderful family tradition that may carry on for generations. It is most effective to have family meetings once a week and to stick to the allotted time of 20 to 30 minutes—even if everything on the agenda has not been covered. This will help your children learn "delayed gratification." Also, it gives them time to absorb what was discussed during the meeting, to try the agreed upon solution, and to practice working things out for themselves in between meetings. My children loved family meetings when they were four to twelve or so. Then they started complaining, as typical teens do, about how stupid family meetings were. I asked them to humor me, and that we could shorten the time from 30 minutes to 15. One day Mary, one of the complainers, spent the night at a friend’s house. The next day she announced, “That family is so screwed up. They should be having family meetings.” When Mary went off to college, she initiated regular “family meetings” with her roommates and said they would not have survived without them. 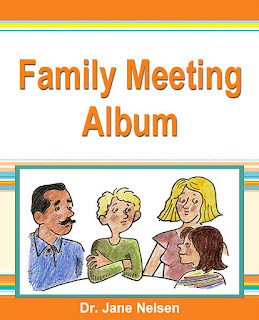 If you need help getting your Family Meetings started, consider getting the Family Meeting Album. 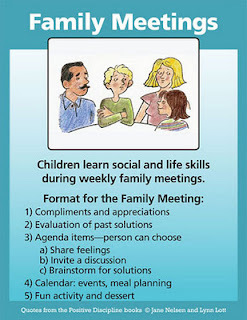 This download product provides a step-by-step process for starting and organizing family meetings. A family meeting album can be as much fun as a photo album. You and your family will chuckle as you look back at past challenges you solved together. You will enjoy looking at your family mottos, gratitude pages, mistakes you learned from, problems you solved, fun things you did together, and meals you planned. 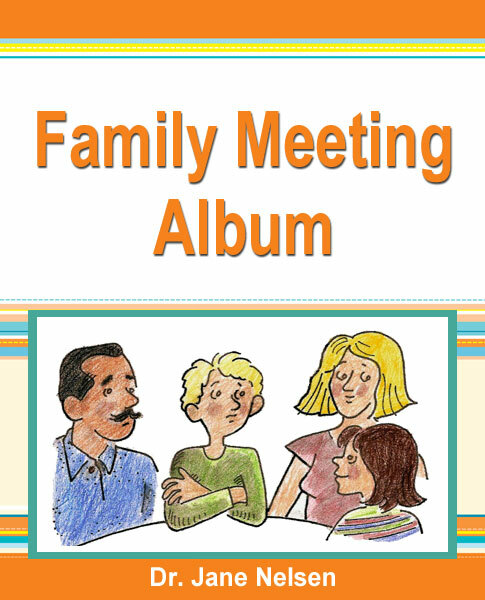 This album is designed so you can insert a photo of YOUR family to create your own Family Meeting Album. You can print out many of the pages over and over to use each week. 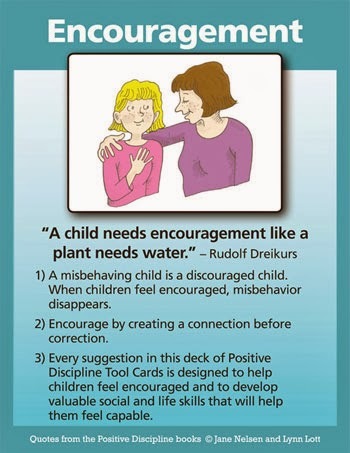 From the Positive Discipline Parenting Tool Cards available at www.positivediscipline.com and as an App for iPhone and Android. React and Correct: Don’t talk to me that way. Why can’t you be more positive, grateful, or respectful? You shouldn’t feel that way. Why can’t you be different—more like your sister or brother? Fix or Rescue: Maybe if you would do this ____, then____. (Maybe if you would be friendlier, then you would have more friends.) I’ll talk to your teacher (or your friend’s mother). Don’t feel bad. Validate feelings: I can see this is very upsetting for you. Sounds like you are really sad, mad, feeling hurt. Ask Curiosity Questions: What happened? Want to talk about it? Invite Deeper Sharing: Anything else? Is there more? Anything else? Anything else? Listen with your Lips Closed: Hmmmm. Have Faith in Your Child: Know that, in most cases, your child simply needs a supportive, listening ear as part of the process of venting before coming up with his or her solution. Through this process your child learns resiliency (“I can deal with the ups and downs of life.") and capability ("I can survive getting upset and figure out solutions."). There are many levels of listening. When parents complain that toddlers don’t listen, that isn’t exactly true. First of all, parents really mean, “This child doesn’t obey,” or, “This child knows better.” They are right about the former (toddlers and preschoolers seldom obey) but wrong about the latter (children under the age of six do not “know better” at the level parents expect.) They may “know” the family rules at a primitive level, but not at a sophisticated level that requires the kind of morality and judgment and responsibility that does not develop until closer to the age of eight. Thus, too many children are being scolded, and even punished, for not having a level of development for which they are not yet capable. How long does it take for a child to learn to talk, and how do they learn? This question is very easy for parents to answer. They know that their children will not learn to talk for at least a year, and that the way they learn is hearing their parents talk to them—the more the better. Then, on that happy day when their child finally says her first word, they don’t start punishing her for not speaking in sentences—at a college level. Yet these same parents punish their preschoolers for “not listening,” for “not sharing,” for “writing on walls” with crayons parents left around where their exploring, experimenting children can find them. At an even deeper level, many parents don’t listen between the lines to the belief behind the behavior. (Perhaps a child is feeling “dethroned” by the birth of a new baby). They don’t listen to hear if their children are feeling powerless or discouraged. They don’t listen from an understanding of developmentally age-appropriateness or brain development (see above). Example is the best teacher. Learn to be a better listener and someday, when all their developmental growing catches up, so will your children. The root word of encouragement is, of course, courage. When we strive to encourage others and ourselves, we are actually helping to develop courage to face life’s challenges and difficulties. Encouragement comes in many forms. Each of the many positive discipline tools is designed to help children feel better (encouraged), so they are motivated to do better. Watch for the foundation of encouragement in every Positive Discipline Tool we will be sharing. Extensive research shows that we cannot influence children in a positive way until we create a connection with them. It is a brain (and heart) thing. Sometimes we have to stop dealing with the misbehavior and first heal the relationship. Connection creates a sense of safety and openness. Punishment, lecturing, nagging, scolding, blaming or shaming create fight, flight, or freeze. One of my favorite examples of “connection before correction” is, “I love you; and the answer is no.” This example also illustrates the Positive Discipline concept of Kind and Firm at the same time. Before sharing more ways to create a connection with children, I want to point out that it is a mistake to think that giving children whatever they want is effective. Rescuing, fixing, and over-protecting are not good ways to create a connection. Effective connections are made when both child and adult feel belonging and significance. 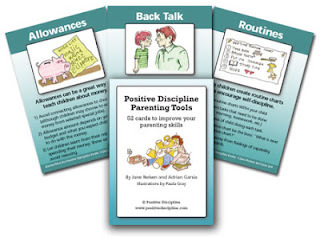 Most of the Positive Discipline parenting tools provide skills for creating a connection. Spend special time with children. What could create a greater connection for your child than to know your enjoy spending time with him or her. Validate your child’s feelings. Don’t we all feel connected when we feel understood? Share your feelings and thoughts when appropriate. 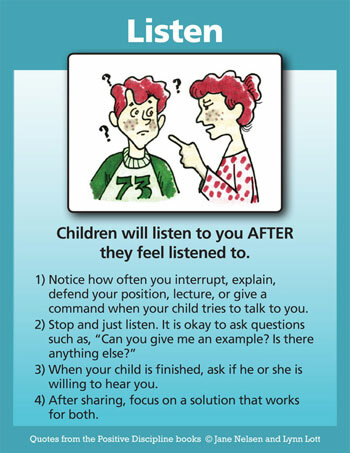 Remember that children will listen to you AFTER they feel listened to. Children feel a connection when you respectfully share something about yourself. Respectfully, means no stories about walking miles in the snow. Focus on solutions WITH children after a cooling off period. There is that word "with" again–because it is a golden bridge to connection. Ask curiosity questions to help children explore the consequences of their choices instead of imposing consequences on them. Sincere questions open the heart and the rational brain—equaling connection. Hugs. There are times when all of us need nothing more than a hug. Once the connection is made, children are then open to respectful correction. It is important to understand that "Correction" in the Positive Discipline way is very different from conventional correction. The biggest difference is that conventional correction usually involves punishment (punitive time-out, grounding, and taking away privileges being the most common). In other words, conventional correction consists of adults doing something TO children. Positive Discipline correction respectfully involves children whenever possible, finding solutions WITH them. Two great methods for finding solutions are family or class meetings and joint problem solving. These are powerful tools that respectfully involve children to learn and use their personal power in contributing ways. Connection is created as part of the process. When children feel a connection, they feel belonging and significance. Often that is enough for misbehavior to stop. As you learn about the many Positive Discipline tools, notice that they are all designed to create a connection before respectful correction. To learn more about Connection Before Correction, listen the following excerpt from the Building Self-Esteem Through Positive Discipline lecture. Take the 52 Parenting Tools in 52 Weeks Challenge. This is a fun way to stay focused on Positive Discipline all year long. We hope you will participate and post comments about your own experiences. 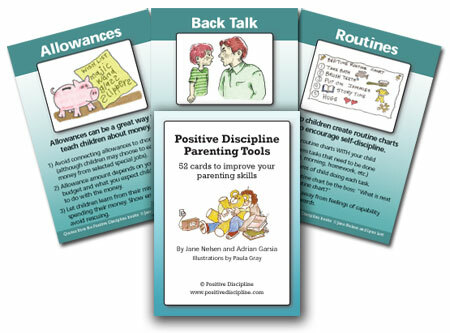 You can get a copy of the Positive Discipline Parenting Tool Cards on the Positive Discipline Website and/or download the App for iPhone and Android. It would also be helpful to read a Positive Discipline Book during the year. The great thing about this challenge is that you can start at any time. It doesn't matter which week you start with, so jump on in and join the fun! Together we can all improve our parenting skills and improve our relationships with our children. Click on the links below to read more about the individual Positive Discipline Tools.